Paisley (/ˈpeɪzli/ PAYZ-lee; Scots: Paisley, Scottish Gaelic: Pàislig [ˈpʰaːʃlɪkʲ]) is a town situated in the west central Lowlands of Scotland. Located on the northern edge of the Gleniffer Braes, the town borders the city of Glasgow to the east, and straddles the banks of the White Cart Water, a tributary of the River Clyde. Paisley's skyline and backdrop from Saucel Hill, with the Thomas Coats Memorial Baptist Church at top in the centre. Thomas Coats Memorial Baptist Church, Paisley, Scotland, ca. 1890-1900. Formerly and variously known as Paislay, Passelet, Passeleth, and Passelay the burgh's name is of uncertain origin; some sources suggest a derivation either from the Brittonic word pasgill, "pasture", or more likely, passeleg, "basilica", (i.e. major church), itself derived from the Greek βασιλική basilika. However, some Scottish place-name books[which?] suggest "Pæssa's wood/clearing", from the Old English personal name Pæssa, "clearing", and leāh, "wood". Pasilege (1182) and Paslie (1214) are recorded previous spellings of the name. The Gaelic translation is Pàislig. Paisley has monastic origins. A chapel is said to have been established by the 6th/7th century Irish monk, Saint Mirin at a site near a waterfall on the White Cart Water known as the Hammils. Though Paisley lacks contemporary documentation it may have been, along with Glasgow and Govan, a major religious centre of the Kingdom of Strathclyde. A priory was established in 1163 from the Cluniac priory at Wenlock in Shropshire, England at the behest of Walter fitz Alan, Steward of Scotland (d. 1177). In 1245 this was raised to the status of an Abbey. The restored Abbey and adjacent 'Place' (palace), constructed out of part of the medieval claustral buildings, survive as a Church of Scotland parish church. One of Scotland's major religious houses, Paisley Abbey was much favoured by the Bruce and Stewart royal families. King Robert III (1390–1406) was buried in the Abbey. His tomb has not survived, but that of Princess Marjorie Bruce (1296–1316), ancestor of the Stewarts, is one of Scotland's few royal monuments to survive the Reformation. Paisley coalesced under James II's wish that the lands should become a single regality and, as a result, markets, trading and commerce began to flourish. In 1488 the town's status was raised by James IV to Burgh of barony. Many trades sprang up and the first school was established in 1577 by the Town Council. The Paisley witches, also known as the Bargarran witches or the Renfrewshire witches, were tried in Paisley in 1697. Seven were convicted and five were hanged and then burnt on the Gallow Green. Their remains were buried at Maxwelton Cross in the west end of the town. This was the last mass execution for witchcraft in western Europe. A horse shoe was placed on top of the site to lock in the evil. A horse shoe is still visible in the middle of this busy road junction today—though not the original. The modern shoe is made of bronze and bears the inscription, "Pain Inflicted, Suffering Endured, Injustice Done". The Industrial Revolution, based on the textile industry, turned Paisley from a small market town to an important industrial town in the late 18th century. Its location attracted English mill owners; immigrants from Ayrshire and the Highlands poured into a town that offered jobs to women and children. However, silk fell out of fashion in 1790. The mills switched to the imitation Kashmir (cashmere) shawls called "Paisley". Under the leadership of Thomas Coats (1809-1893), Paisley became the world centre for thread making. The high-status skilled weavers mobilised themselves in radical protests after 1790, culminating in the failed "Radical War" of 1820. Overproduction, the collapse of the shawl market and a general depression in the textile industry led to technical changes that reduced the importance of weavers. Politically the mill owners remained in control of the town. By the mid-19th century weaving had become the town's principal industry. The Paisley weavers' most famous products were the shawls, which bore the Paisley Pattern made fashionable after being worn by a young Queen Victoria. Despite being of a Kashmiri design and manufactured in other parts of Europe, the teardrop-like pattern soon became known by Paisley's name across the western world. Although the shawls dropped out of fashion in the 1870s, the Paisley pattern remains an important symbol of the town: the Paisley Museum maintains a significant collection of the original shawls in this design, and it has been used, for example, in the modern logo of Renfrewshire Council, the local authority. Through its weaving fraternity, Paisley gained notoriety as being a literate and somewhat radical town and between 1816 and 1820 became the scene of a Radical War. Political intrigue, early trades unionism and reforming zeal came together to produce mass demonstrations, cavalry charges down the high street, public riots and trials for treason. Documentation from the period indicates that overthrow of the government was even contemplated by some. The weavers of Paisley were certainly active in the 'Radical War'. A mixture of religious opinions and healthy drink-fueled debate raged at night amongst the weavers, poets, merchants, masons and others. The perceived radical nature of the inhabitants prompted the Tory Prime Minister Benjamin Disraeli to comment "Keep your eye on Paisley". The poet Robert Tannahill lived in this setting, working as a weaver. Paisley's annual Sma' Shot Day celebrations held on the first Saturday of July  were initiated in 1856 to commemorate a 19th-century dispute between weavers and employers over payment for "sma' shot" – a small cotton thread which, although unseen, was necessary in holding together garments. A permanent military presence was established in the town with the completion of Paisley Barracks in 1822. The economic crisis of 1841–43 hit Paisley hard as most of the mills shut down. Among the mill owners, 67 of 112 went bankrupt. A quarter of the population was on poor relief. The Prime Minister, Sir Robert Peel decided to act. He secured additional funds for relief and sent his own representative to the city to supervise its distribution. He convinced Queen Victoria to wear Paisley products in order to popularise the products and stimulate demand. The American Civil War of 1861–1865 cut off cotton supplies to the textile mills of Paisley. The mills in 1861 had a stock of cotton in reserve, but by 1862 there was large-scale shortages and shutdowns. There were no alternative jobs for the workers, and local authorities refuse to provide relief. Voluntary relief efforts were inadequate, and the unemployed workers refused to go to workhouses. Workers blamed not the United States, but rather the officials in London for their hardship and did not support the idea of war with the United States. Paisley suffered heavy losses in the First World War. Its war memorial was designed by Sir Robert Lorimer (other sources say Harold Tarbolton) in 1922 and depicts Robert the Bruce going into battle on horseback escorted by footsoldiers dressed as First World War infantry soldiers. It was sculpted by Alice Meredith Williams. Paisley was also the site of an incident that gave rise to a major legal precedent. In a Paisley cafe in 1928, a woman allegedly found a dead snail in a bottle of ginger beer, and became ill. She sued the manufacturer for negligence. At the time a manufacturer was considered liable only if there was a contract in place with the harmed party. However, after Donoghue v Stevenson wound through the courts, a precedent was established that manufacturers (and other "neighbours" or fellow citizens) owe a duty not to do foreseeable harm to others by negligence, regardless of contractual obligations, which paved the way for modern tort law. The case is often called the "Paisley snail." Owing to its industrial roots, Paisley, like many industrial towns in Renfrewshire, became a target for German Luftwaffe bombers during World War II. Although it was not bombed as heavily as nearby Glasgow (see Clydebank Blitz), air raids still occurred periodically during the early years of the war, killing nearly a hundred people in several separate incidents; on 6 May 1941, a parachute mine was dropped in the early hours of the morning claiming 92 victims; this is billed the worst disaster in Paisley's history. The Gleniffer Braes, on the southern outskirts of Paisley, are home to a number of "decoy ponds" (mock airfields) used by the RAF after the Battle of Britain as part of a project code-named "Starfish Decoy" designed to confuse German spies. Paisley, as with other areas in Renfrewshire, was at one time famous for its weaving and textile industries. As a consequence, the Paisley pattern has long symbolic associations with the town. Until the Jacquard loom was introduced in the 1820s, weaving was a cottage industry. This innovation led to the industrialisation of the process and many larger mills were created in the town. Also as a consequence of greater mechanisation, many weavers lost their livelihoods and left for Canada and Australia. Paisley was for many years a centre for the manufacture of cotton sewing thread. At the heyday of Paisley thread manufacture in the 1930s, there were 28,000 people employed in the huge Anchor and Ferguslie mills of J & P Coats Ltd, said to be the largest of their kind in the world at that time. In the 1950s, the mills diversified into the production of synthetic threads but production diminished rapidly as a result of less expensive imports from overseas and the establishment of mills in India and Brazil by J & P Coats. By the end of the 1993, there was no thread being produced in Paisley. Both industries have left a permanent mark on the town in the form of the many places with textile related names, for example, Dyer's Wynd, Cotton Street, Thread Street, Shuttle Street, Lawn Street, Silk Street, Mill Street, Gauze Street and Incle Street. The town also supported a number of engineering works some of which relied on the textile industry, others on shipbuilding. Paisley once had five shipyards including John Fullerton and Company (1866–1928), Bow, McLachlan and Company (1872–1932) and Fleming and Ferguson (1877–1969). A number of food manufacture companies existed in Paisley. The preserve manufacturer Robertsons began in Paisley as a grocer whose wife started making marmalade from oranges in 1860. This product was successful and a factory was opened in Storie Street, Paisley, to produce it in 1866 and additional factories were later opened in Manchester, London and Bristol. The company was taken over by Rank Hovis McDougall who closed its Stevenson Street factory and transferred production to England in the 1970s. Brown and Polson was formed in Paisley in 1840 and two years later started producing starch for the weaving trades, by 1860 it was making food products including its patent cornflour. It later became CPC Foods Ltd, a subsidiary of Unilever, which produced Hellmann's mayonnaise, Gerber baby foods and Knorr soups. The company ceased production in Paisley in 2002. In 1981 Peugeot Talbot, formerly Chrysler and before that Rootes, announced that its Linwood factory just outside Paisley would cease production. This led to the loss of almost 5,000 jobs. At one time M&Co. (Mackays) had its head office in Caledonia House in Paisley. In 2015, the town launched its bid to become UK City of Culture in 2021. On 15 July 2017 Paisley was announced as one of five shortlisted candidates,  however on December 7, 2017 Paisley lost its bid to Coventry. Following the announcement, Renfrewshire Council and the Paisley 2021 Board stated that Paisley's "journey will continue" and that the bid process was "just the beginning" for regeneration processes to begin in the town. Paisley sits primarily on an expanse of low ground around 12 metres (40 ft) above sea level surrounding the White Cart Water, which runs through the town centre. There are some hills and ridges which have been absorbed as the town has expanded. The settlement is historically centred on Oakshaw, an area surrounding a hill to the north of the current High Street. Oakshaw is a conservation area, and on the high ground many of Paisley's significant buildings can be found, such as the High Kirk, the Coats Observatory and the former John Neilson Institution, which was once a school and is now converted into residential flats. Around the centre there are a large number of older residential buildings. The town centre, Whitehaugh, Seedhill and Charleston areas contain many examples of Scottish tenement flats. Three to four storeys tall, with shops on the ground floor and constructed of local pale and red sandstone, these tenement flats have been extensively restored and modernised over the last two decades[when?]. Paisley expanded steadily, particularly in the Victorian and Edwardian eras, creating many suburbs. Castlehead is a wooded conservation area primarily made up of Victorian villas where many of the town's leading industrialists made their homes in the late 19th century. Thornly Park is another conservation area, to the south of the town, just off Neilston Road heading towards Barrhead. It contains a variety of architecture ranging from mock Tudor to Art Deco. Many of the houses were designed by W. D. McLennan, a contemporary of Charles Rennie MacIntosh. McLennan also designed several local churches such as St Matthew's and St Nazarene, which is located on Gordon Street. Particularly following the Housing Act 1946, modern Paisley grew into the surrounding countryside, and several large residential areas were created in the post-war period. These include portions of Glenburn (south), Foxbar (south west), Ferguslie Park (north west), Gallowhill (North East) and Hunterhill (South East). Gockston in the far north of the town has many terraced houses, and after regeneration has many detached and semi-detached houses as well as several blocks of flats. Dykebar, to the south east of the town centre, is a residential area which is also the site of a secure psychiatric hospital. On the outskirts of the town are a number of settlements such as Ralston, a residential area in the far east bordering the city of Glasgow. Ralston was outside the Paisley burgh boundary when constructed in the 1930s, but as a result of local authority reorganisation in the 1990s, it is now a suburb of Paisley. In modern times, the public sector is a significant employer in Paisley, with the headquarters of Renfrewshire Council, the largest campus of the University of the West of Scotland, the Paisley campus of West College Scotland and the Royal Alexandra Hospital all located in the town. Glasgow Airport, located on the northern edge of Paisley, is also a significant employer and part of the area's transport infrastructure. The airline Loganair's registered office is located within the airport complex. Scotch whisky blenders and bottlers Chivas Brothers, now a subsidiary of Pernod Ricard, are also located in the town. The site of the former Rootes/Chrysler/Talbot on western the outskirts of the town is now home to Phoenix Retail Park. Numerous private developers have invested, creating various retail outlets, vehicle showrooms, restaurants, a cinema complex, hotel and a business centre. As the administrative centre of the county of Renfrewshire, Renfrew District and, currently, Renfrewshire council area, Paisley is home to many significant civic buildings. Paisley Town Hall, adjacent to the Abbey, was funded by the will of George Aitken Clark, one of the Clark family, owners of the Anchor Mills. 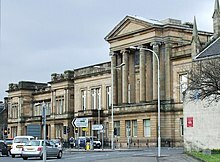 In competition, Sir Peter Coats funded the construction of the modern Paisley Museum and Central Library (1871), also in a neo-Classical style. The Clarks and Coats families dominated Paisley industry until their companies merged in 1896. Renfrewshire's former County Buildings, Police Station and Jail on County Square have been since demolished, and the County Council then met in a newer neo-classical building which now houses Paisley Sheriff Court. Renfrewshire House, the modern headquarters of Renfrewshire Council, was constructed as Paisley Civic Centre. Designed by Hutcheson, Locke and Monk following a competition, the building was designed to house offices of both the county and town councils. It was intended to become a civic hub for Paisley but the absence of any shops and non-council premises prevented this from happening. It became the home of the Renfrew sub-region of Strathclyde Regional Council in 1975 and of Renfrewshire Council in 1996. It is listed by the conservation organisation DoCoMoMo as one of the sixty key Scottish monuments of the post-war period. Other civic buildings of interest include the Russell Institute, an art deco building constructed in 1926. Most noticeable among the buildings of Paisley is its medieval Abbey in the centre of the town dating from the 12th century. The earliest surviving architecture is the south-east doorway in the nave from the cloister, which has a round arched doorway typical of Romanesque or Norman architecture which was the prevalent architectural style before the adoption of Gothic. The choir (east end) and tower date from the late 19th and early 20th centuries and are examples of Gothic Revival architecture. They were reconstructed in three main phases of restorations with the tower and choir conforming to the designs of Dr Peter MacGregor Chalmers. The roof in the nave is the most recent of restorations with the plaster ceiling by Rev Dr Boog which was added in the 1790s being replaced by a timber roof in 1981. Thomas Coats Memorial Baptist Church, named for the industrialist Thomas Coats (1809–1883), is an example of Gothic Revival architecture. It dominates the town's skyline with its crown spire more than 60 metres (197 ft) high. Opened in 1894 and designed by Hippolyte Jean Blanc it is the largest Baptist church in Europe. The exterior is made of old red sandstone. Inside, the church is decorated with wood carvings, mosaic floors and marble fonts. The church also contains a 3040 pipe Hill Organ. The St Mirin's Cathedral in Incle Street is the seat of the Catholic Bishop of Paisley. The church was completed in 1931 to replace an earlier building, in nearby East Buchanan Street, which dated from 1808. The original St Mirin's church was the first Catholic church to be built in Scotland since the Reformation. With the erection of the Diocese of Paisley in 1947 the church was raised to cathedral status. St Matthew's Church (Church of the Nazarene) at the junction of Gordon Street and Johnston Street is Art Nouveau in style. Designed by local architect William Daniel McLennan, a contemporary of Charles Rennie Mackintosh, it was built in 1905–07. As a result of its historic textile industry, Paisley has many examples of Victorian industrial architecture. Most notable is the Category A listed Anchor Mills, built in 1886. The building was converted in 2005 into residential flats. Textiles have a longer history in Paisley, represented by the Sma' Shot cottages complex on Shuttle Street: a small public museum of weaving from its 18th-century origins as a cottage industry. Another landmark connected with the textile industry is the Dooslan Stane or Stone. The stone was a meeting place of the Weavers Union in the south of Paisley; it was also used as a "soapbox" and was originally inscribed with its history (now largely faded). It was moved from its original site at the corner of Neilston Road and Rowan Street to its present location in Brodie Park. Also present, arranged around the Dooslan Stane, are the four original Paisley Tolbooth stones. The Dooslan Stane is still used today as the congregating point for the annual Sma' Shot parade which takes place on the first Saturday in July. The High Street drill hall was completed in about 1896. The composer Thomas Wilson's 1988 work Passeleth Tapestry (later his Fourth Symphony) commemorates the history of Paisley in a single 30-minute movement. Commissioned by Renfrew District Council to mark Paisley's 500th anniversary as a burgh of barony, it was premiered on 6 August 1988 in Paisley Abbey with the Royal Scottish National Orchestra under Bryden Thomson. The town also has a memorial to the legal case of Donoghue v Stevenson, also known as the Paisley Snail Case, which established the modern rules of negligence in Scots law and the legal systems of the Commonwealth. Paisley is the main site for the modern University of the West of Scotland, which was created from a merger between the University of Paisley and Bell College in Hamilton, South Lanarkshire. The University of Paisley was granted university status in 1992, having existed previously as a central institution known as Paisley College of Technology. The further education college West College Scotland has a campus in the town; this institution was previously known as Reid Kerr College. There are currently four comprehensive state secondary schools in Paisley: Paisley Grammar School, Castlehead High School, St. Andrew's Academy and Gleniffer High School. The oldest of these is Paisley Grammar which was founded in 1576 and was one of two former grammar schools in the town – alongside the former John Neilson Institution (latterly John Neilson High School) founded in 1852. Other former secondary schools in the area include Merksworth High School (to the north west of the town), St Mirin's Academy or High School (on the west side of the town), St Aelred's High School and Stanely Green High School (both on the south side of the town). Of the current secondary schools in the town, all are non-denominational save for St Andrew's Academy which is a Roman Catholic school. Paisley is home to a number of religious denominations and is an important historical centre for the Christian faith in Scotland. The town's historic patron saint is Saint Mirin (or Mirren); according to legendary accounts, Mirin settled in Paisley as a missionary sent from Ireland in the 6th century and was instrumental in bringing the relics of St Andrew to Scotland. Paisley Abbey, one of the towns most significant landmarks, was constructed as a priory in the 12th century and raised to abbey status in the 13th. It served as an ecclesiastical centre for a wide area surrounding the county of Renfrewshire for centuries until the Reformation when such religious centres were reduced to the status of parish churches. For the Church of Scotland, Paisley forms part of the Presbytery of Greenock and Paisley in the Synod of Clydesdale (see: Church of Scotland synods and presbyteries). Other Christian communities have a number of churches in Paisley, many of which were the result of the Industrial Revolution where people from around the British Isles came to Paisley for work. The Roman Catholic Diocese of Paisley, created in 1947, is centred upon the town's St Mirin's Cathedral, the seat of the Bishop of Paisley. Paisley also forms part of the Episcopalian (Anglican) Diocese of Glasgow and Galloway with its main facilities being contained at the Holy Trinity and St Barnabas Church in the town centre, a congregation which united in 2004. There are currently two Baptist congregations in Paisley: in addition to Thomas Coats Memorial Baptist Church (see under "Landmarks - religious sites") is Central Baptist Church, which meets in nearby Lady Lane. Paisley is home to a meetinghouse of the Church of Jesus Christ of Latter-day Saints located on Glenburn Road. Other smaller religious groups exist in the town. The Methodist Church of Great Britain has a church and central hall opposite Paisley Abbey which forms part of the Ayrshire and Renfrewshire Circuit. The Christadelphians meet in a hall on Alice Street. Historically, Paisley was notable as the religious home of the Stewart family who descended from Walter FitzAlan, the first High Steward of Scotland and founder of Paisley Abbey, eventually becoming the Scottish and British Royal Family. The Stewarts once resided at a castle in nearby Renfrew. All six of the High Stewards are buried in the Abbey, as is Marjorie Bruce – the eldest daughter of Robert I of Scotland (Robert the Bruce) – who married the 6th High Steward, thus founding the Stewart dynasty. The first Stewart King of Scotland and son of Marjorie Bruce and Walter Stewart, Robert II, is believed to have been born in the Abbey. His son Robert III is buried there. Ronald Reagan's maternal great-great-grandparents, Claude Wilson and Margaret Downey, were married at Paisley High Church on 23 May 1807. Paisley has one local daily newspaper, the Paisley Daily Express, which is owned by the Trinity Mirror Group. Various local radio stations have operated at times, including Q96 from 1992 to 2007 – serving the Renfrewshire area, although for a considerable period based in neighbouring Glasgow. Its replacement, Glasgow-based Guardian Media Group station 96.3 Rock Radio carries Renfrewshire focused material. Since October 2011 Rock Radio, faced with falling advertising revenue, was rebranded by Guardian Media Group as Real Radio XS after a proposed management buyout failed to materialise. St Mirren F.C. is Paisley's sole professional association football team. As of 2018, it plays in the Scottish Premiership. In 2009, the team moved from their Love Street stadium to a new 8,029 capacity stadium, known formally as St Mirren Park, on Greenhill Road. The stadium was later renamed as The Paisley 2021 Stadium to mark the town's bid to be UK City of Culture in 2021. St Mirren last won the Scottish Cup on 16 May 1987. Since then, the club has won the Scottish First Division title twice, in 1999–2000 and in 2005–06, as well as winning the Challenge Cup in 2005. The club won the Scottish League Cup for the first time in its history on 17 March 2013. In addition to professional football, the club is also involved in youth development and social projects in the town. Another professional football team, Abercorn F.C., was based in Paisley until its decline and liquidation in 1920. Basketball has a strong history in Paisley. St Mirren is a leading basketball team, currently[when?] competing in Division 1 of the Scottish National League. The team was formed in 1997 and are regular challengers at the top of the table. They have won the National League title once, in 2000, and have won the Scottish Cup three times (1999, 2002 and 2012). Previously, Paisley BC were one of Scotland's strongest teams in the heyday of the 1970s and 1980s. The team broke the dominance of Edinburgh-based Boroughmuir, who had won the National League title in the previous nine seasons, with their triumph in 1979. Including their merger to become PSG, Paisley spent thirty seasons in the top division of Scottish basketball, from the National League's formation in 1969 until 2000. After disappearing for more than a decade, the club has been revived. Paisley Rugby Club is an amateur rugby union club based at the Anchor Recreation Grounds in Paisley. The club is currently[when?] in the Scottish BT West Division 2. The club runs two adult teams and several youth teams. The 1st XV was coached by Grant Sweenie and Les Wilson and captained by David Dodd for the 2015-16 season. The 2nd XV was captained by Scott Glover. With a mix of youth and experience, Paisley's 1st XV finished 6th in BT West Division 2, after gaining promotion for finishing 2nd in BT West Division 3 the previous year. Paisley 2nd XV secured their best ever league position of 5th in the BT Reserve League West 2 in 2014-15. Paisley is also home to the Kelburne Hockey Club, who have dominated Scottish domestic hockey in the last 3 seasons.[when?] Kelburne HC run 5 gentlemen's teams and 3 ladies' teams, and have over 100 juniors regularly competing for the club at district and national level. Kelburne HC also supplies the men's Scottish National Team with the vast majority of its players. The club has also had success in Europe with recent[when?] tournament victories in Austria and Switzerland. Motorcycle speedway was staged at St Mirren Park (Love Street) in 1975 and 1976, when the Paisley Lions raced in the second division of the British League. The Lions were moderately successful but despite the best efforts of their supporters, the venue ceased to operate. Paisley Gilmour Street railway station. Paisley is connected to the motorway network and the National Rail network, and contains Glasgow Airport within its boundaries. Paisley is connected by road to the UK motorway network, with the M8 running along the northern edge of the town, providing access to Greenock to the west and Glasgow to the east. This forms part of the unsigned E05 Euroroute from Greenock to Gibraltar. Many major A roads converge through the town, including the A726, A737 and A761. The Strathclyde Partnership for Transport, a public body, has direct operational responsibilities covering the area, such as supporting (and in some cases running) local bus services in Paisley and across Strathclyde. The town has four railway stations and is linked by rail to Glasgow city centre as well as Inverclyde and the Ayrshire coast. Paisley Gilmour Street is the largest of the stations and is also the fourth busiest train station in Scotland. There are also smaller stations at Paisley St James, Paisley Canal and Hawkhead. The rail links also connect to Glasgow Prestwick International Airport and ferry routes to Dunoon, the Isle of Arran, Isle of Bute and Northern Ireland. Over the years there have been thirteen railway stations in Paisley and three rail lines that are now closed (The Paisley and Barrhead District Railway, the Barrhead Branch of the GSWR, and the Paisley and Renfrew Railway). Paisley Canal station and the Paisley Canal Line owe their names to the Glasgow, Paisley and Johnstone Canal which occupied the route of the line until 1885, when it was filled in. 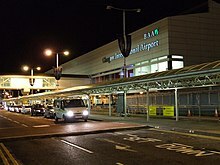 Glasgow Airport, operated by AGS Airports, is Scotland's largest airport, located to the north of Paisley at Abbotsinch. It is adjacent to the M8 motorway and served by buses from Paisley Gilmour Street railway station. The planned Glasgow Airport Rail Link project, which was to run through Paisley, was abandoned in 2009. As mentioned above, Glasgow Prestwick Airport in Ayrshire is directly accessible by rail from Paisley Gilmour Street station. Paisley lies within the Renfrewshire and Inverclyde Division of the Scottish police service and is one of three Area Commands in that division. Paisley is divided into five community policing areas: Paisley North-west (incorporating Glasgow Airport); Paisley South-west; Paisley East and Ralston; Paisley South; Gallowhill (as part of Renfrew and Gallowhill). Gallowhill is covered by the Renfrew Area Command. For judicial purposes, the area forms part of the sheriffdom of North Strathclyde and public prosecutions are directed by the Procurator Fiscal for Argyll and Clyde. There is a Sheriff Court at Paisley, which occasionally houses sittings of Scotland's High Court of Justiciary. NHS Greater Glasgow and Clyde is the National Health Service Board serving Paisley and the town's main hospital with accident and emergency facilities is the Royal Alexandra Hospital. Strathclyde Fire and Rescue is the statutory fire and rescue service covering Paisley, with one community fire station on the town's Canal Street. Water and sewerage is provided in Paisley by Scottish Water, a public body, and water and sewerage charges are collected alongside council tax by Renfrewshire Council, the local authority, on its behalf. Renfrewshire Council is also responsible for the provision of waste management in the area. Paisley's Distribution Network Operator, the organisation licensed to transmit electricity from the National Grid to consumers, is Scottish Power. ^ "Extracts from the records – 1588 | British History Online". British-history.ac.uk. 22 June 2003. ^ "Paisley | As described in F.H. Groome's Ordnance Gazetteer of Scotland (1882–4)". Visionofbritain.org.uk. ^ Pieraccini, Piero (2 June 2010). "Help Needed lucky Horseshoe missing". Paisley Development Trust. Retrieved 2 December 2013. ^ A. Dickson and W. Speirs, "Changes in Class Structure in Paisley, 1750-1845," Scottish Historical Review (1980) 59#1 pp 54-72. ^ a b "Renfrewshire Community Website – Textile industry". Renfrewshire.gov.uk. 11 September 2007. Archived from the original on 15 March 2011. ^ Andrews, Meg. "Beyond the Fringe: Shawls of Paisley Design". victoriana.com. ^ "Renfrewshire Community Website – Textiles". Renfrewshire.gov.uk. 5 May 2005. Archived from the original on 5 August 2012. ^ Rowand, David (1993). Pictorial History of Paisley. Catrine, Ayrshire: Stenlake Publishing. pp. 4–17. ISBN 978-1-84033-435-7. ^ "Paisley Online". paisleyonline.co.uk. 7 July 2012. ^ "Renfrewshire Community Website – Sma' Shot Day". Renfrewshire.gov.uk. Archived from the original on 17 August 2011. ^ Groome, Francis H. (1882). "Ordnance Gazetteer of Scotland: A Survey of Scottish Topography, Statistical, Biographical and Historical". Thomas C. Jack, Grange Publishing Works, Edinburgh. ^ Tony Dickson and Tony Clarke, "Social Concern and Social Control in Nineteenth Century Scotland: Paisley 1841-1843," Scottish Historical Review (1986) 65#1 pp 48-60. ^ "Basic Biographical Details - Harold Ogle Tarbolton". ^ "Tale of Buddies who perished in World War II". Paisley Daily Express. 19 January 2011. ^ "Paisley's contribution to the Second World War". Paisley Daily Express. 17 October 2011. ^ "Coats Viyella". Archiveshub.ac.uk. Archived from the original on 19 July 2012. ^ Robert J. Allan (1991). Geoffrey Rootes' Dream for Linwood: Pictorial Look at a Landmark in British Car Manufacture. ISBN 978-1-870519-12-0. ^ "Contact Us." Mackays Stores. Retrieved on 1 February 2012. "Mackays Stores Ltd Caledonia House Caledonia Street Paisley PA3 2JP"
^ "Paisley launches bid to become UK City of Culture 2021". BBC News. 13 November 2015. ^ "Support pours in as Paisley becomes only Scottish place on UK City of Culture 2021 shortlist". Paisley 2021 Website. Retrieved 23 July 2017. ^ "Paisley's 'journey will continue' despite culture bid disappointment". 7 December 2017. ^ "Historical perspective for Paisley". Scottish-places.info. ^ "Paisley 1981–2010 averages". Station, District and regional averages 1981-2010. Met Office. Retrieved 2012-11-04. ^ Stephen, Leslie, ed. (1887). "Clark, George Aitken" . Dictionary of National Biography. 10. London: Smith, Elder & Co.
^ Frank Arneil Walker (1986). The South Clyde estuary: an illustrated architectural guide to Inverclyde and Renfrew. Scottish Academic Press. ISBN 978-0-7073-0476-2. ^ "History of Paisley". Paisley.org.uk. Archived from the original on 2 October 2006. ^ "Thomas Coats Memorial Church: Architecture". Fenet.co.uk. ^ "The Prince's Regeneration Trust". Princes-regeneration.org. ^ "Sma' Shot Cottages, Paisley". Smashot.co.uk. Archived from the original on 8 October 2011. ^ "Paisley, 76 High Street, Drill Hall". Canmore. Retrieved 27 June 2017. ^ "Saint Mirin – Our Patron Saint | Paisley Scotland". Paisley.org.uk. ^ a b "The Cradle of the Stewarts | Paisley Scotland". Paisley.org.uk. ^ "Contact Us « Holy Trinity & St Barnabas, Paisley". Episcopalpaisley.org.uk. ^ "Ayrshire & Renfrewshire Methodist Circuit Home page". Arc-methodists.org.uk. ^ a b c d e "10 reasons why Paisley is already a city of culture". BBC. 13 November 2015. ^ Ediciones El País. "David Waterston, 'Whisky David', músico bohemio". EL PAÍS. ^ "Hon John Barr". The Evening Post. CX (137). 8 December 1930. p. 13. Retrieved 19 July 2012. ^ Molloy, Brian P. J. "Sinclair, Andrew". Dictionary of New Zealand Biography. Ministry for Culture and Heritage. Retrieved 2 December 2010. ^ "St Mirren - Football". BBC Sport. Retrieved 14 September 2018. ^ "Paisley 2021 stadium will boost town's culture bid". Paisley 2021 website. 30 November 2015. ^ "Scottish Football Association: The Scottish FA: Scotland :". The Scottish FA. Archived from the original on 27 June 2008. Retrieved 27 June 2008. ^ Strathclyde Partnership for Transport (5 September 2007). "Who we are". spt.co.uk. Archived from the original on 12 December 2007. Retrieved 11 February 2008. ^ a b "Paisley and Barrhead District Railway". homepage.ntlworld.com. Archived from the original on 27 September 2007. ^ "Paisley and Renfrew Railway". homepage.ntlworld.com. Archived from the original on 11 October 2008. ^ "Renfrewshire and Inverclyde Division". Police Scotland. 2013. Retrieved 21 May 2013. ^ "Renfrewshire Local Policing Plan, p.11 & Appendix B". Police Scotland. 2013. Retrieved 21 May 2013. ^ "Paisley area plan". Strathclyde Fire and Rescue. Archived from the original on 11 September 2012. Retrieved 5 August 2011. ^ "Electricity Distribution Network Operators". energylinx.co.uk. 2007. Archived from the original on 14 January 2008. Retrieved 5 February 2008. Clark, Sylvia (1988). Paisley: A History. Edinburgh: Mainstream. ISBN 1-85158-109-X. Dickson, A., and W. Speirs. "Changes in Class Structure in Paisley, 1750-1845." Scottish Historical Review (1980) 59#1 pp 54–72. Dickson, Tony, and Tony Clarke. "Social Concern and Social Control in Nineteenth Century Scotland: Paisley 1841-1843," Scottish Historical Review (1986) 65#1 pp 48–60. Hunter, Jim. "The Paisley Textile Industry, 1695–1830." Costume 10.1 (1976): 1-15. McCarthy, Mary (1969). A Social Geography of Paisley. The Committee of Management, Paisley Public Library. Moisley, H.A. ; Thain, A.G. (1962). "Chapter 23: The Parish and Burgh of Paisley". The Third Statistical Account of Scotland: The County of Renfrew. Glasgow: William Collins Sons & Co.
Wikivoyage has a travel guide for Paisley.